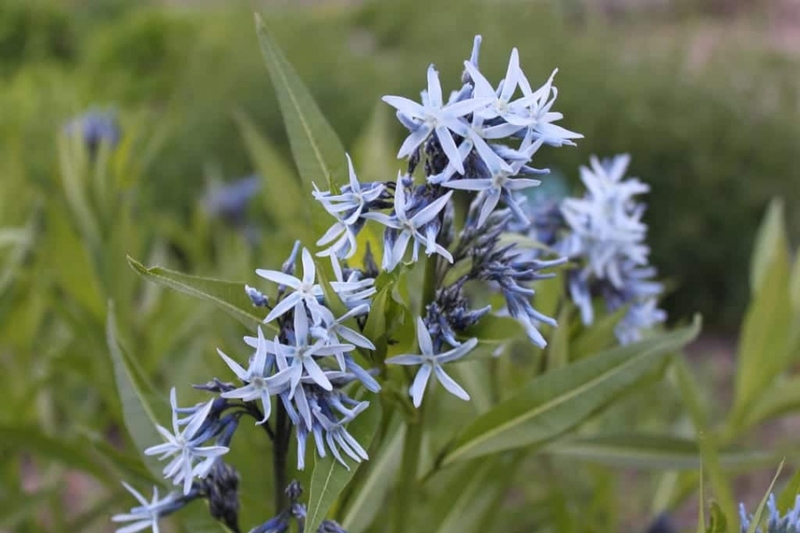 Eastern Bluestar (Amsonia tabernaemontana): growing, planting, caring. Amsonia tabernaemontana - the Eastern Bluestar - is a perennial species of the family Apocynaceae. It will do well in a light soil in full sun, even if it is dry. Amsonia tabernaemontana commonly referred to as the eastern bluestar is a perennial species of the family Apocynaceae. It is a tuft with many stems. The leaves are small, elliptical, dark green. Flowering occurs from May to July in 2cm panicles of rounded cymes. Amsonies support ordinary, cool, well-drained soil. Find a location in the sun. Dip the clumps in a tray filled with water to moisten them well. Plant them when the water is no longer flowing out of the bucket. Prepare the soil: make holes, leaving a spacing of 20 to 30 cm between each, and mix the soil with potting soil and sand if it is heavy. Put the plants in there. Finish filling with soil and tamp it gently to avoid air around the roots. Water a lot. Water during the summer season once a week if the weather is dry. Remember to keep the leaves dry ! Mulch, it will prevent you from watering and weeding in summer, and - even if they are rather hardy: it will protect the roots of cold in winter.